Japan is a happy hunting ground for Australian lightweight contender Adrian Pang. He was one of the first competitors to set foot inside a cage in the martial arts hotbed country, winning the inaugural main event inside a cage back in November 2006. Now the 41-year-old Queenslander is gunning for another opportunity to compete in Japan. “I really would love to fight in Japan but that card’s stacked already,” Pang said of ONE: A NEW ERA on 31 March, which boasts the rescheduled Strawweight World Title bout between China’s Xiong Jing Nan and Singapore’s Angela Lee, the Lightweight World Championship rematch between Filipino superstar Eduard Folayang and Japan’s Shinya Aoki and the Middleweight World Title clash between Myanmar’s Aung La N Sang and Japan’s Ken Hasegawa, as well as the debuts of American superstars Demetrious Johnson and Eddie Alvarez. “There’s three title fights, Alvarez is on it, Demetrious is on it, so unless I’m on the undercard I doubt I’ll be on that card,” he continued. With much of the card already assembled, Pang stressed he would happily accept a prelim bout. 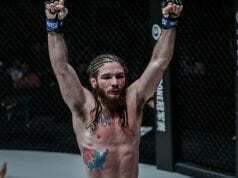 “I’ll fight whenever Chatri [Sityodtong] wants me to,” he said. “I fought in the first ever cage event in Japan. I fought in the main event and I won by submission. The ONE Lightweight World Grand Prix is also around the corner, but Pang said he’s had no correspondence from Sityodtong about the tournament. “Not at all,” Pang said. “If they put me in the Grand Prix that would be awesome. I don’t know if they would consider me for it, but I really don’t care. I’m going to get paid regardless of where I get to fight. Snapping a four-match losing streak with victory over Koto Shimoishi at ONE: HEART OF THE LION last November, Pang is brimming with new confidence. “I don’t get fat, it’s just my abs aren’t as ripped. That’s the only difference,” Pang added. Pang said he was eager to challenge Japan’s Koji Ando or even tackle a rematch with Honorio Banario following their tight battle back in April of last year. But Pang plans to leave that all in the hands of the matchmakers. “Even my fight against the current champion (Eduard Folayang) wasn’t one sided l, so I think I can hang in there with anybody.